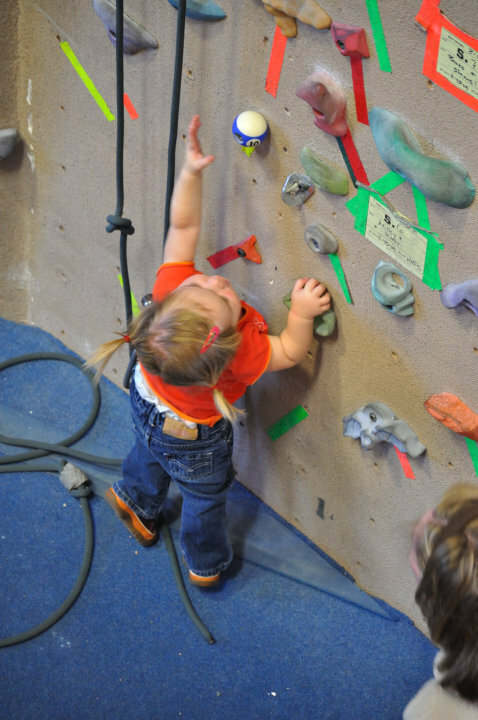 A toddler reaches for a handhold on a climbing wall at the Spire Climbing Center. The center is offering a camp for kids during spring break. The Spire Climbing Center is hosting a camp for kids of all ages this spring break that will get kids climbing off more than just the couch. Renee Freeman, one of the instructors for the camp, said that the younger kids will be playing a variety of classic games with a slight twist by including the climbing walls. Freeman said some of the games will include musical climbing, red light green light, capture the flag and wall tag. The older groups of kids will focus more on specific skills stations. These will first include the basics and, according to Freeman, can advance depending on the level of experience of the kids. The community has responded extremely positively, according to Freeman, and the Spire has answered by “adding more camps and classes.” According to the Spire’s website, some of these newer programs for kids are Saturday morning classes and after school sessions for both public and home school students. The Spire’s website maintains a policy that it is open to “all interested participants” regardless of skill or age and includes “a state-of-the-art rope climbing system that spans 6,000 square feet.” The Spire also includes an additional 2,200 square feet of “bouldering space” for shorter non-rope climbs. The three-day event, which begins March 12, will include age groups of 5-7, 8-10 and 11-16 according to the Spire’s website. They also ask that participants reserve spots. There are only 20 spaces open per age group, per day.